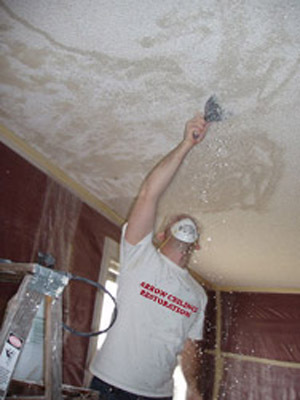 Longboat Key Ceiling Contractor specializes in Popcorn Ceiling Removal and Textured Ceilings and Walls. Popcorn ceiling removal is one of the must do items in any remodel or update project for your Longboat Key home. Scraping off your popcorn ceilings provides a very visible, and therefore profitable upgrade to your home. The task of removing an acoustic ceiling popcorn is not complicated, but it is very hard work and is best done by a qualified expert. With the popcorn ceilings removed you will see a noticeable improvement! If you have textured walls it is often appropriate to match the ceiling texture to the wall texture. Common forms of texture are Knockdown, Crow's Foot, and Orange Peel. If you want a smooth ceiling your project will require skimcoating. This is the process of applying a thin layer of compound over the ceiling and then sanding it smooth. With your ceilings textured or skimcoated, all there is left to do is prime and paint! Visit the Image Portfolio to see the results of a popcorn removal job.